There is a notable growth in the number of social media users who are now setting their accounts to include location in their posts: Among adult social media users ages 18 and older, 30% say at least one of their accounts is currently set up to include their location in their posts, up from 14% who said they had ever done this in 2011. There is a modest drop in the number of smartphone owners who use “check in” location services: Some 12% of adult smartphone owners say they use a geosocial service to “check in” to certain locations or share their location with friends, down from 18% in early 2012. Among these geosocial service users, 39% say they check into places on Facebook, 18% say they use Foursquare, and 14% say they use Google Plus, among other services. The full report and the survey questions can be downloaded for free or read online. Multiples listing services (MLS) provide information about homes to nearly every major online provider. However, what about the brokers who want to post their own set of promotional materials and collaterals to their clients? Wayfiler provides a way for brokers and realtors to put custom information online that is related to the physical addresses of the homes. Present customized information that will augment MLS listings. Tie specific content to the location of the property. Access stills, PDFs and video of the property. Any entity with a campus – a hospital, university or historical site, for example – needs a way for visitors to find valuable, relevant information, all while reducing the cost of print materials. Direct family members and friends with a hospital floor map and other rich media so they can visit their loved ones. Tag specific marketing and admissions information to buildings for the academic departments housed within for a self-guided walking tour. Visitors could chart their path by tagging their photos and links about the Washington Monument, besides the official guides and documents. 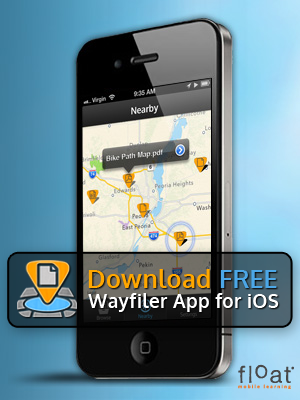 Whether you’re a speaker or attendee, bypass conference-sponsored apps and Wi-Fi in favor of Wayfiler. Speakers can instantly share their deck only with the people that attend their session. Attendees can crowdsource their favorite materials to supplement the speaker’s presentation. Conference organizers can tag their conference brochures to the event’s venue, eliminating the expense of a custom application.